When you are heading out to the road, you may want to bring your favorite drink along. However, a problem arises when you want to keep the temperature of the drink. Insulated bottles such as Hydro Flask vs Yeti Rambler offer a convenient solution to keep warm drinks warm and cold beverages cold. So, which one actually is better? – Which insulated bottle that is more recommended for the money. 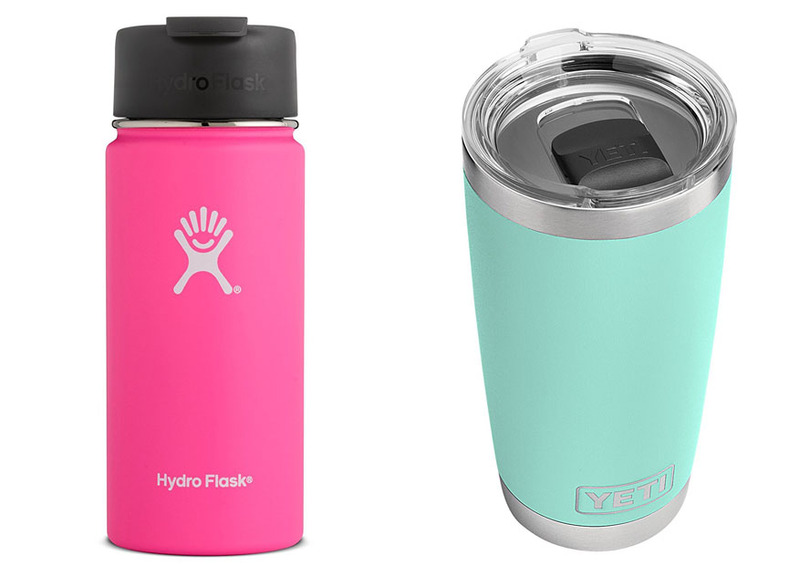 Both products are available in many color choices, although Hydro Flask is available in slightly more colors and gradients than Yeti Rambler. Nevertheless, you can find your favorite color with either brand. Both also have excellent build quality. They are sturdy and durable. See also: Klean Kanteen vs Hydro Flask. However, there are some differences with their exterior surfaces. Hydro Flask has a powder coating, which makes it very comfortable to hold. Unfortunately, the powder coating renders the bottle unsuitable for cleaning in a dishwasher. It should be washed by hands to preserve the powder coating, otherwise it may peel off. On the other hand, Yeti Rambler has a pure stainless steel exterior. It does not feel as comfortable. It may feel very cold when the environment temperature is really low – when this happens, touching it without a glove can chill your hand. However, it is very easy to clean as it is dishwasher-safe. Additionally, Yeti Rambler has a unique lid design. It is significantly more durable and spill-proof. In normal circumstances, Hydro Flask is just as good, but when an accident happens, Yeti Rambler can keep more water inside. Both Hydro Flask and Yeti Rambler bottles are available in various sizes. There are 12-oz, 16-oz, 18-oz, 20-oz, and even larger models available – you can find the available models of Hydro Flask here. A smaller bottle is more portable, suitable for work or school, whereas a larger bottle can hold enough water for a long travel. However, if we observe the prices of Hydro Flask and Yeti Rambler from the smallest size to the largest size, we may notice some differences. Hydro Flask products are slightly more affordable compared to Yeti Rambler, especially on the larger sizes. This is a point to consider if you want to get the most value from your money. The main reason why you want an insulated bottle is because you want to keep your beverages at their ideal temperatures. The performance of Hydro Flask and Yeti Rambler is quite similar in the first four hours. However, after multiple hours, Hydro Flask has proven that it can maintain both warmer and colder temperatures longer than Yeti Rambler. Hydro Flask has many more accessories than Yeti Rambler. For example, it has many different lids and straws, so you can easily customize your drinking experience. In addition, Hydro Flask comes with a lifetime warranty. On the other hand, Yeti Rambler has fewer accessories. A lifetime warranty is available with an additional charge. If you don’t want to pay the additional charge, you will only get a limited warranty. Between Hydro Flask vs Yeti Rambler, we highly recommend Hydro Flask. It offers the best value for the money. It has better insulation performance, so it can keep your drinks at the desired temperatures longer. It also has more accessories and comes with a lifetime warranty with no additional charge.